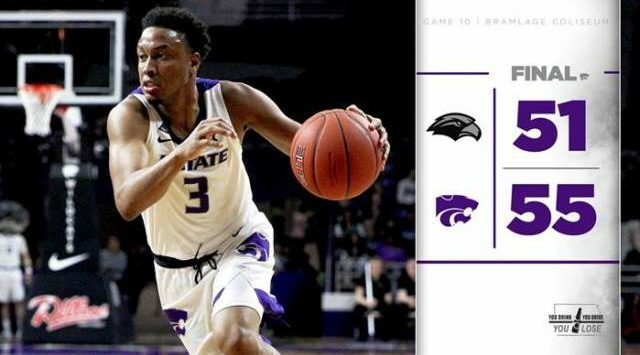 MANHATTAN, Kan. – Senior Kamau Stokes scored 16 of his season-high 18 points in the second half, as Kansas State overcame a 16-point deficit to top Southern Miss, 55-51, in front of 8,815 fans at Bramlage Coliseum on Wednesday night. K-State (8-2) went on a 24-2 run over 8:08 in the second half to take over the game, as the Wildcats held the Golden Eagles scoreless for 5:24 during the span. The run came after scoring a season-low 19 points in the first half and the fewest since scoring 15 against TCU on Feb. 18, 2015, as the Wildcats trailed 31-19 at halftime. The 16-point deficit overcome for victory tied for the third-largest in school history, including the largest since coming from 16 points down to defeat New Mexico on Nov. 23, 2005. In addition to Stokes, senior Barry Brown, Jr. reached double-digits in scoring behind 15 points, while junior Xavier Sneed pulled down a career-high 14 rebounds to lead all players and give the Wildcats a 38-32 edge on the glass. As a team, K-State shot 45.5 percent (20-of-44) from the field, including a 12-of-18 (66.7 percent) mark in the second half. The Wildcats found their first 3-pointer of the contest fall in the second half, when Stokes made back-to-back 3-pointers with 14:15 left in the second half. Southern Miss (7-4) was led by senior Cortez Edwards’ 18 points, as the Golden Eagles shot just 31.7 percent (20-of-63) in the game, including 22.9 percent (8-of-35) in the second half. K-State has now won 28 consecutive non-conference games at Bramlage Coliseum. The Wildcats have won eight in a row at home, including all five to start the season. The Wildcats jumped ahead early 7-0 on due to strong defensive play, as K-State held Southern Miss to miss on its first seven shots. The Wildcats found an advantage in the paint, scoring 4 of their first 5 points near the basket. After the slow start, the Golden Eagles bounced back by scoring 11 straight points against the Wildcats, connecting on 5 of 6 from the field. The run gave Southern Miss the lead 11-7 with 11:33 left in the first half. 19 points at the break were the fewest by the Wildcats since scoring 15 points at TCU on Feb. 18, 2015. K-State connected on 30.8 percent (8-of-26) from the floor in the first half, including 0-of-9 from beyond the arc, as opposed to Southern Miss’ 42.8 percent (12-of-28) shooting from the field. The Wildcats were led by a team-high 8 points from Brown and 9 rebounds by Sneed. In the second half, the Wildcats were able to respond at the 14:13 mark when Stokes connected on consecutive 3-pointers, marking the first of the game to bring the score within single-digits at 35-27. The Wildcats would claw back into the lead, as they extended their run to 24-2 to make the score 43-37 with 7:57 left to play. The run was due in part to K-State finding its rhythm offensively, while forcing Southern Miss into difficult shots. With K-State leading at 46-44 with 3:07 left in the contest, Stokes connected on his fourth 3-pointer of the half to extend the lead to 49-44. Southern Miss closed to within 53-51 with 11 seconds left on a pair of free throws by Dominic Magee, but Brown knocked down a pair of free throws to finish it off. Kamau Stokes – Leading the Wildcats with a season-high 18 points on 6-of-8 from the floor and 4-of-6 from beyond the arc, senior guard Kamau Stokes propelled the Wildcats to a come from behind victory. Stokes scoring output included 16 points in the second half alone, including four influential 3-pointers. 24-2 – Down 35-19 with 16:05 left in the second half, a jumper by Kamau Stokes ignited a 24-2 run that gave the Wildcats the lead for good at 43-37 lead at the 7:57 mark.